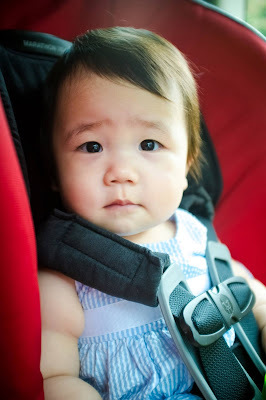 Beginner's Photography Classes: Photography Classes' Notes - Photography Contest and Thick Skin. Hello everyone! Today I want to talk about the importance of photography contest and how it helps you as a photographer. 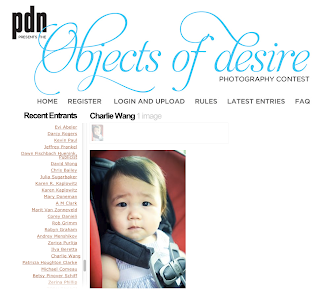 The photo contest I recently entered was the PDN "Object of Desire" 2013 contest. I submitted my baby's photo I took when my family was on our way to a wedding. I usually do not see her in a nice dress, so I took some snaps of her. When I got home, I saw the PDN photo contest calling for submissions and I submitted this photo below as my entry for the category of "beloved". I saw the judging process of the contest, and I thought "why not?". My beautiful daughter, Gwyneth Isabelle Wang, in this off the cuff shot for PDN's "Beloved" category photography contest submission. Now, I'm under no illusion, my submission will definitely win. It would be just nice to be mentioned. If I do win, then I will have some bragging rights for the whole year. However, contest like this attracts many other hopefuls like me and even more serious professional who do aim to win. Photo contest in nature is a promotional tool for the companies hosting it. It is a matter of what kind of contest they are hosting. Contest comes in two forms: Top heavy contest and spread out prizes contest. The top heavy contests are those contests that only have a grand prize winner. The prize are alluring with, for example, TV spot or 6 page spread in a magazine; a month long mentorship with a high profile photographer or art director; and lots of cash. Typically, this contest have a page where you can see all the contestant's entries, and the company hosting it expects the entrants to ask their friends and family to look at them. Driving traffic and ad revenue to pay back for the cost of hosting the contest. By having an entry fee to cover their initial cost, the spread out prizes contest can have with multiple tiers of winners. These contests will be judged more fairly, in my opinion because it is less sale pitchy. Even if you do not win the grand prize, perhaps just placing high enough will be the exposure you need. Compare to top heavy contests, you can still have some decent exposures. So why do you want to enter a photo contest, and how does it help you? Well, photography is immensely personal and subjective. Sometimes having someone else, who is qualified, to judge your photography skills against your peers is a good barometer. You can tell how well you fare with reading the instructions and produce what the judges are looking for. This is a great way to experience how a career in photography feels like - reading briefs and producing what the director wants. Only in a contest, there's no real penalty to your reputation is you fail. The webpage of PDN's Object of Desire contest where my entry is among the hundreds of hopeful photographers, advanced hobbyist to professional. Of course, if the judges don't understand your work as an artist, it doesn't mean you should stop pursuing your artform. It just means your art is not suited for the contest. And learning how to be humble is really key to be a great photographer. Photography once shared it's for the public to judge and criticized - and everyone is a critic. Learning how to grow a thick skin is something we all need to learn. It's important to know that there's a reason why contests exist. Some contests really want to see the next great idea, and really look forward for the gem among the entries. While other contests are set up to make the host of the contest more relevant to search engines, the targeted communities, or their advertisers/sponsors. For you, it's about learning yourself in how to read a job description and deliver the right photograph. Study your process and learn if you can repeat the process. If it is an award winning shot, can you repeat it again for paying clients? This is how it happened for me when someone wanted his headshot to be like an entry I entered when I was in college. And lastly, learning to have a thick skin. Here's more resources on how contests work and learn to be humble. This is Charlie Wang, signing off. Please come back more for Lesson 4 launching soon on Beginner's Photography Classes.